The latest built up Bitx from HF Signals looked like a bargain too good to pass up. At only USD 59, you get a built up Bitx 40m metre transceiver with an Si5351a frequency synthesiser for tuning. I ordered it on the 3rd of January and it arrived on the 18th January to Australia, not too bad from India. The kit arrived well packed inside a plastic food container which kept everything safe on the way. India post sent a tracking number but it didn’t update during transit, so it was a surprise to see it arrive unexpectedly. At this price it hardly makes sense to do you own pcb, source components and debug! The main radio transceiver PCB is a well soldered and neat SMD layout. Also included are standoffs, wiring assemblies connectors and pots. It’s a bit larger than some of my existing 40m homebrew transceivers at 128 x 114 mm for the main board. I would like to convert it to 20 metres as there are already several homebrew radios on 40m in the SOTA kitbox. When time permits, a PCB lightweight case will be made for it. It will be interesting to see how it performs! At the garden’s expense, it was wired up this afternoon and tested. It powered up OK and receives. The minimum discernable signal is about 0.1uV, similar to the KD1JV rig. There is a low level clicking in the receiver at a rate of about 10 Hz, presumeably from the digital side. The tuning method takes some getting used to. A potentiometer is used for tuning, the mid range of the pot sort of fine tunes, and when you get to the edges, it fast tunes in 10kHz steps. Sometimes it flips back and forward in 100Hz units. I found that connecting the PA power ground reduced the background noise in the receiver a bit. The receiver draws about 175mA. The mic., PTT and PA power were wired up, but unfortunately, no RF. It looks like there is RF in there somewhere, but it is not making it to the antenna connection. A PTT increases the current to about 400mA and a whistle doubles that, but no RF out. If the PA power is removed, so is the TX current. Maybe its the relay. Yep, it was the relay. After removing it I found that it doesn’t switch either set of contacts despite making a slight click with 12V applied. That would also explain the strange noise when switching from TX to RX as the receiver amp is not disconnected. The coil measures 900 Ohms. This one from Altronics will probably do as a replacement. Relay fixed and it seems to be functional, although down on output power. The case made from PCB for it below. A top half will house the speaker. Dimensions of the box (outside) are 173 x 122 x 47 mm. The controls were kept as close as practically possible to keep the size of the box down. It will be used for SOTA, so the smaller the better. The transceiver seems very susceptible to power supply noise. The Raduino produces quite a bit of noise that can be heard when tuning and generally when idle. This can be removed with a series 10 Ohm resistor to the Raduino supply and a 470uF capacitor to ground on the Raduino side. It is basically working although there are rather loud clicks between TX and RX as well as a burst of carrier on PTT. To get around some of the susceptibility to noise on the power rails, a small filter board was added between the DC in and receiver, Raduino and PA DC power. The board also has a 1N5408 shunt diode across the DC in case of reverse polarity. RF out is also down, something to look at when time permits. The RF out issue turned out to be a measurement problem not a radio problem. Its transmitting about 4.5 W @ 12V. The PA heatsink was changed for this one from Jaycar that provided a bit more cooling plus it did not hang off the board as far as the one supplied. It has mounting pins although the holes had to be isolated from the ground plane. Finished case, just need to add some labels. Also see method to make speaker holes using strip board as a template / drill guide. Hi Jack, the front panel was made from single sided PCB. I just used a drill and file to cut out the display area. The panel was then painted with flat black spray paint. It doesn’t really look like its made from PCB. For a bezel, I might put a piece of clear acrylic sheet between the display and panel. Hello Briarty Hill vk3yy, I am working to use LibreCad software http://librecad.org to create a drawing for a Bitx40 16 gauge sheet metal enclosure. There is a place around here with a CRC Plasma cutter to start from flat sheet metal and cut into a shape. Add a couple 90 degree bends and have a 3 sided sheet metal box. Add a 3 sided top and have a complete box to mount a Bitx40 inside. Do you have any paper drawings with dimensions that you could snap a focused photo from that you would share with me? I have not bought a Bitx40 just yet, I would like to build a metal box first. I am looking for more information on positioning the pots and controls on the front panel too. What hole size did you drill for the different pots? Is it a standard 3/8 0.375 inch hole? Also when positioning the pot/control what area behind the mounting hole needs to be clear so that it does not touch other objects? Thank you for the pictures of the front and rear panel with the parts mounted there. That is very helpful to me to visualize what goes where. I can duplicate that basic layout in LibreCAD. Do you have any changes in panel placement you would recommend after using your Bitx40 for awhile? Are you left handed, Briarty? I am left handed myself. I see you have the control knob mounted on the left side. Maybe a post on your ideas about your layout of the front panel and back panel. Is it LCD 16×2 mounted on the right side front panel for layout of the cable to the Bitx40 board? I can even see the hole for mounting the IRF150 on the back panel. Will you use the copper foil for heat dissipation? Are you adding a aluminum or copper heat sink? Lots of questions from me. Answer what questions you chose, Briarty. Thanks again for the pictures! I wonder how much larger to make a closure to add space for either a antenna tuner or digital psk31 interface. 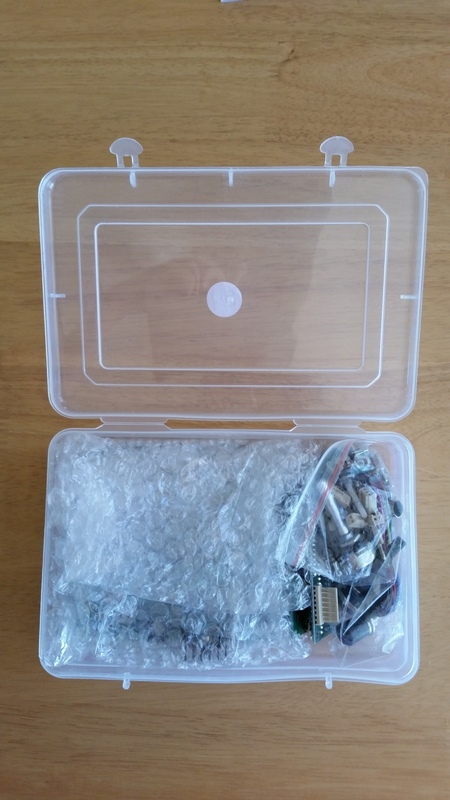 What would you suggest for future ideas, if one had the space inside the enclosure box. Maybe mount a second PCB panel box to eliminate electrical noise from emanating the electronics added in that second box. That would mean to make the metal enclosure box a little taller? ps. thanks for your posts on http://groups.io/g/BITX20, Briarty Hill. That is how I traveled the link to here. Hi Fred, I didnt do any drawings of the box, I just measured the outline of the PCB and added some room for wiring and connector protrusions for the base. For the front panel, I just laid the display, pots and socket out and choose the layout where they could be mounted close together without fouling on the rear side. Yes, I am left handed and that was why the control are on the left side. I can measure up the box when I am home and take better photos if it helps. The IRF 510 has its own heatsink at this stage and not coupled to the case. 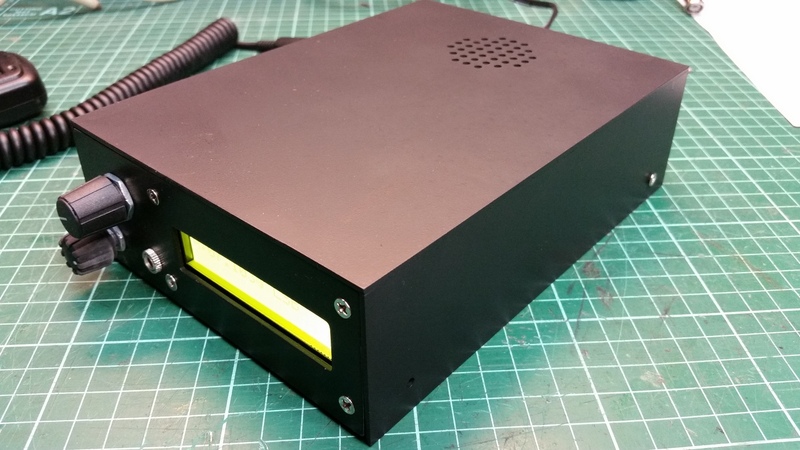 In this project, the aim was for a compact case for SOTA, the only allowance is for an internal battery pack on the top lid. The pot drill holes were eyeballed, but can check those. Cheers, Glenn. Nicely done! I ordered mine today and expect to get it in 2-4 weeks (Seattle, USA). I plan to copy your design (I’m also a lefty). Also planning to use it primarily for SOTA. I’ll be looking to power it with either 3 or 4 14650 LiPO batteries built into the case so mine may be a bit taller. SO-239 UHF Connector 0.641 inches surounded by 4 0.1250 (1/8 inch) holes separated by 0.718 inches on center, equi-distant around the central 0.641 hole. 1.016 across center to center for 0.125 holes or 0.5077 at 45 degress. Hope this helps someone else make their box. Briarty Hill, Do these numbers match your hole sizes for the shafts? I could use the overall outline for volume potentiometer along with the hole for the offset tab to prevent the volume control from turning in the shaft. Making sure not to place controls to close together such that they interfere with each other. Fred, post information here or send me an email. Glad to see you enjoying your Bitx40. Do you have a cad drawing or can you measure the distance from center to center on mounting holes for the Bitx40 pcb and the Raduino boards, please. I don’t have a Bitx40 to make my own measurements from. I want to make drill holes for mounting studs that fit the bitx40 pcb to the metal case. Can you help? http://kliktel.org/bitx40/img I created a web page to show photos of my Bitx40 Box. I could use help confirming measurements of sizes for mounting holes, knob size, clearance behind the panel. Glenn, just discovered this post, great job on boxing up yout Bitx. You sure generated some international traffic on box design, Briarty Hill 8^) ROFL … interested to see how you like it on a summit. For me the receiver is the crucial factor. I would also put it on 20, and add CW, although there won’t be much happening there for a few years. 73 vk3hn. Thanks Paul, yup, looks like I have a new name! Still shaking down the Bitx! Yes, it would be better on 20m, too many HB rigs on 40m here. Looks like you are going to build the uBitx..! Yes Briarty, like you I was very intetested in the HF1 concept, but apart from labelling a box to collect a few parts did not commence it. I was concerned about my ability to get the higher frequency filters working. But with uBitx it looks like Ashar has simplified a few things and, most importantly, he is on groups.io daily to answer questions, along with hundreds of others. So its now a good time to build it. It is wondetfully modular, moreso than the Bitx20/40, and represents a real maturing of the design. So if it doesnt work for me the modules will go together to make a nice monoband superhet. I put the HF1 on hold for several reasons, one was performance. Might restart the project as a uBitx. 73, Briarty. 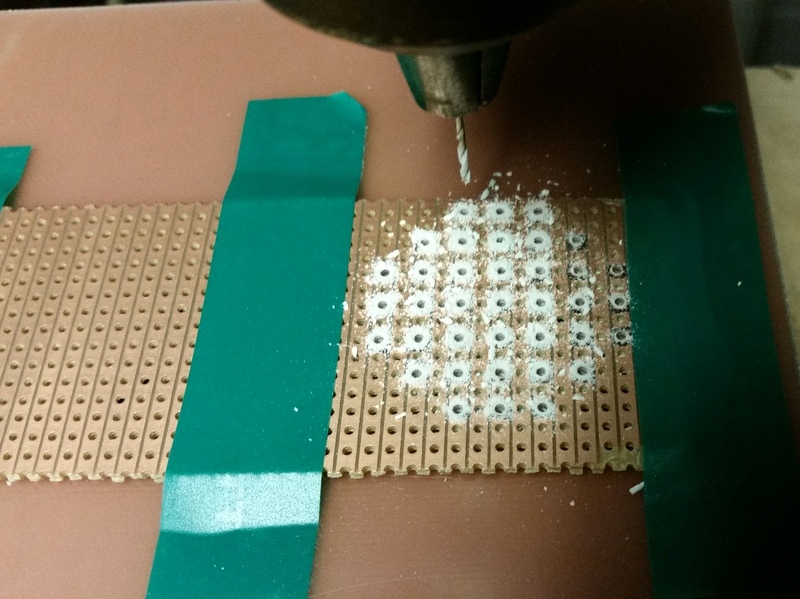 Thanks for showing your speaker grid drilling routine, I never thought of using Veroboard as a template! It works very well! I have reused the same template several times now. I have a very similar problem with my Bitz 40. It will work on RX but no TX when switched to TX. the current will not change at all. I don’t know what the problem is yet. More details WRT the box lid? The box and lid were made from standard G10 single sided PCB. The ends of the base section were soldered to the base section with a square holding them and braces were made from small triangles of single sided PCB and soldered at each end. You have to be careful to watch the right angle as you solder it, it tends to pull in. The lid was made the same way. The fibreglass side of the box (outside) was simply painted with flat black paint. 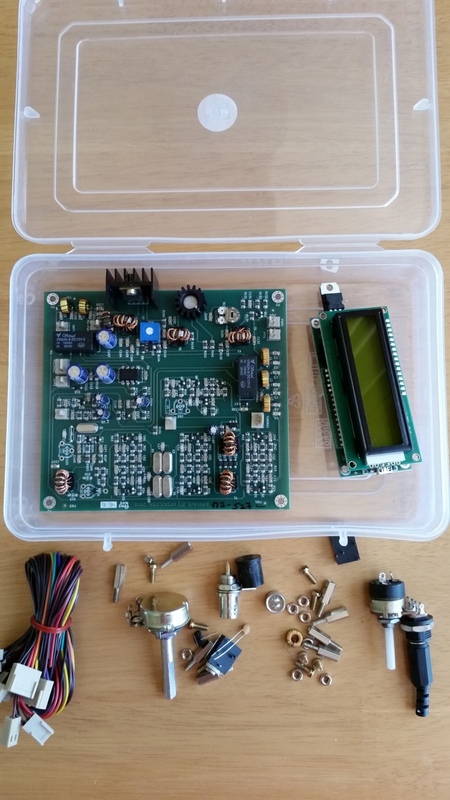 Would you have the BOM and schematic for the power filter board? I would like to add this to my Bitx40. I am told that firmware updates have eliminated the tuning issue and clicking. I will be trying that out soon. The filter is pretty basic, it has main 12V supply entering with a 10uF 25V to ground, a 1N5408 diode to ground for reverse polarity protection, supply then goes to the main board and then a series 10 Ohm resistor followed by a 250uF which feeds the Raduino. I have my Bitx 40 running but i’m finding that the audio from the mic pre-amp is to low at normal speech. What is the maximum drive level that the mixer can take to get a good audio level? I think I will need to put a better mic pre-amp in the unit. I also have a lot of reverie hiss on the audio. Maybe there is too much gain here and it needs to be reduced to get around this?